Using 2017 SV650 engineering, the V-Strom’s DOHC, liquid-cooled engine has new camshafts to deliver clean, strong power at any RPM. The new multi-function instrument panel is similar in appearance to the V-Strom 1000 panel, but has functions unique to the V-Strom 650XT. New beak-style fairing, with vertically stacked headlights and new mounting structure helps the V-Strom 650XT cut through the wind, protecting the rider in style. 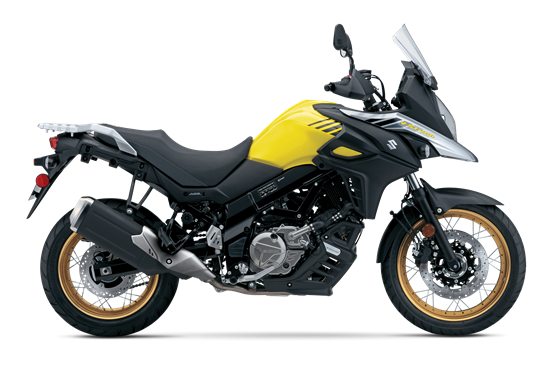 The V-Strom 650XT is supplied with hand guards and a protective lower engine cowl. Adventure-spec Bridgestone BATTLAX 19-inch front and 17-inch rear tubeless radial tires are mounted to the spoke-style wheels for good all-around performance.